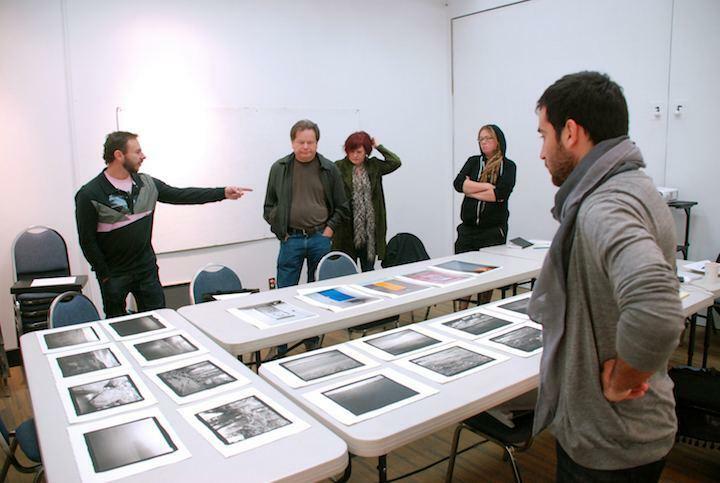 Words and Images At portfolio reviews in the last year I've increasingly encountered practitioners who have a consistent body of work, and an articulate artist statement—but the two things have little to do with each other. You might start with the work; you might start with the statement. But before you present them, consider having someone else look at the work and tell you five things they see in it; then have a different person read your statement and tell you five things they think they will see in your photographs based on your statement. A good artist statement can elucidate subtle facets of your work, add personal history or information that connects you to the project or subject matter, and enhances the visual experience through language expression. But remember that an artist statement can't be required for someone to access your work—first and foremost you must be communicating visually. Michelle Dunn Marsh at Palm Springs Photo Festival. Photo by, and courtesy of, Mary Virginia Swansonn [sign up for her newsletter here]. Captions are your friend. And they don't always have to be titles; sometimes they can just be captions, identifying key elements such as medium, location, and time period. You know that information when you are looking at work; why wouldn't you offer the same information to your viewers? There are sometimes assumptions that captions will obscure or interfere with a viewer's appreciation of your artistry. Back to point one—first and foremost you must be communicating visually. If your photographs are powerful in terms of subject matter explored through your distinctive vision, captions can only help. Research and collaboration We have a few annual call for entries at PCNW: we just closed a panorama call; and just opened Long Shot, which is a summer solstice celebration of photographs all made on the same day—everyone who submits has a photograph selected for the slideshow and one-night exhibit, regardless of your level of experience. 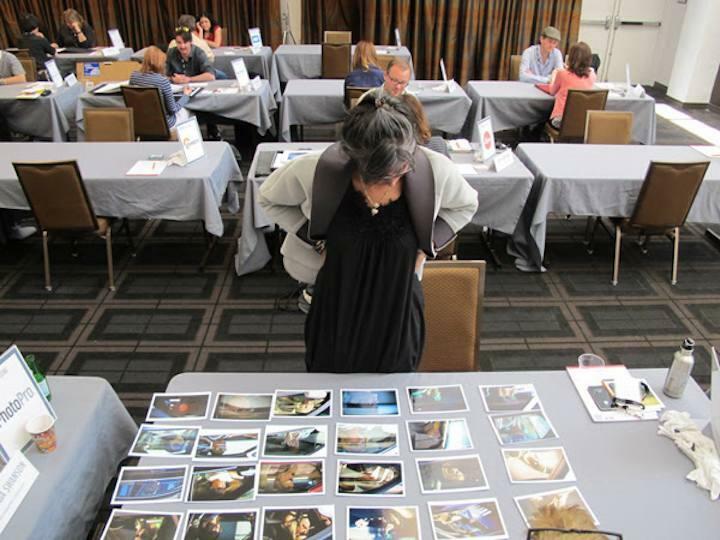 That's a very different jurying process than our annual exhibition, which this year will be selected by Whitney Johnson of the New Yorker, and has a documentary theme. Knowing the goals and parameters of each call, of the person or persons reviewing, and of the end intention (a prize, a grant, an exhibition, etc) should inform the work you choose to submit. Master workshop with Richard Renaldi at PCNW. Photo courtesy PCNW. I have been surprised by the number of people who don't actually know that the summer solstice marks the longest day/most light of the year, or what "documentary" means [one definition is to provide a record of social and political situations with the aim of conveying information]. Look it up! Research is one of the most enjoyable aspects of developing a project from a body of photographs, particularly when you start to think about a book or an exhibition. Themes and limitations can become inspirational, pushing you to look at different bodies of work you've created, or for something annual like the W. Eugene Smith Fund, perhaps motivating you to create a body of work that could be completed with the grant's support. Though we live in the "me" culture, it's great to see so many people embracing collaboration; my former students from Parsons who formed Conveyor come to mind as a great example of the benefits of working together; Eli Hansen's book Even Crooks Have To Pay The Rent through Minor Matters has a team of over ten people currently involved—before we've even gone into production. Keep in touch with people who inspire you, or who you inspire—it can be lonely in the art world when you are no longer a student, and your colleagues are your sounding boards as well as your network. Success for any of you will be good for all of you. Attitude There was a period of time when you could be a little difficult (or a lot), but if your work was great people tolerated bad attitudes or inflated egos. It's much harder to navigate forward these days if you are challenging to deal with—there's simply so much work being produced that editors, curators and tastemakers have no shortage of work and artists they can champion, and they have to make choices all the time about who and what will get priority. The person you meet with today may run the museum you desperately want a solo show in tomorrow. Treat experience with respect. Engage with people who have been in the field longer than you, and learn from them. So be patient, get to know people, let them get to know you, and focus on your creation. At the end of the day that is why we are all here—because you create. And we care about what you create and want to experience it. You can't make someone care about your work; but you can respect and respond when they do.